I guess I've always had a sensitive side but it was hidden under the many layers of me. I think it initially surprised everyone in my family when as the Matron of Honor at my brother's wedding, there were tears streaming down my face as his bride walked down the aisle. Everyone asked what was wrong with me, including my brother - the groom; I was simply happy because I love love! This sensitive side started to emerge after I had children. I found myself being sad when my children were sad. Sometimes a tear would fall during a conversation but I'd say it was allergies. I knew something had definitely changed in me when I found myself crying during movies and at commercials. I used to cry out of anger but it seems I've gone way beyond that. It seems like almost any emotion is a reason to cry. When I think of the state of affairs in this crazy world we live in - the uncaringness and hardness of the human heart; I weep. The resilience of people of who have overcome the unthinkable - I've been reading many stories on the Syrian refugees....all I can say is "My God." In a similar vein when I see what Black people went through in America and what they continue to go through, I'm astounded; I weep. When I think about the state of my family - there's sickness, job loss, estrangement and a host of other trials; I weep. Of course, recently, after completing a run, I found myself losing all composure and crying. Snot falling, loud sobbing and total convulsions as I cried. It came out of nowhere and left in the same manner. But I also weep when I think about the fact that I am loved, that I am married, that my children are happy, that I have another day to be alive. 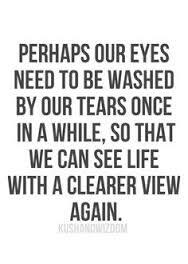 I won't ignore my feelings that bring tears to my eyes; instead, I'll let them be, knowing that they provide greater clarity. .....You have collected all my tears in your bottle.You have recorded each one in your book.